With the ‘lazy days of’ summer waning, I have been making some time for myself. I can always find myself doing other things that need to be done like house cleaning, gardening, grass cutting, or computer work. In fact, I could do that constantly if I don’t force myself to do something relaxing. Once I decided to take a break, it didn’t take long to remember those innocent days of my childhood summers and reading Nancy Drew Mystery stories. 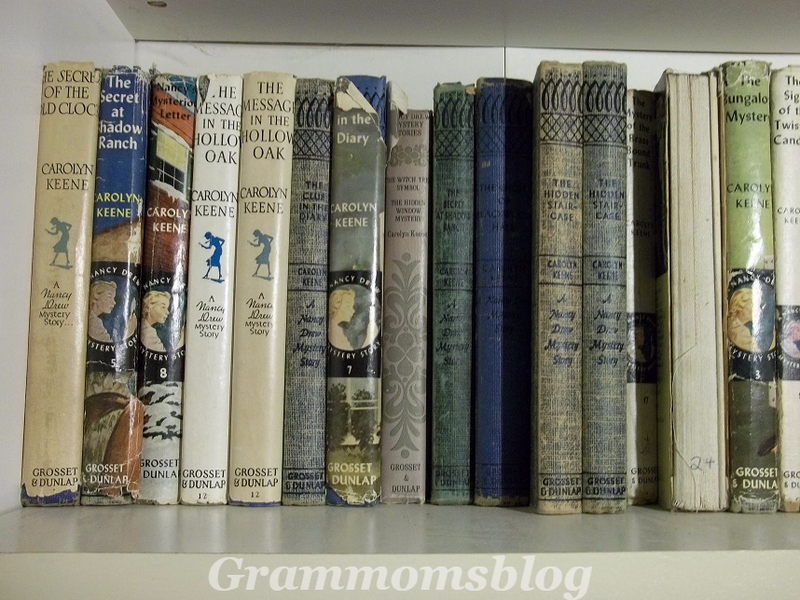 My sister Betty got me interested in reading Nancy Drew – in fact, in reading, period. Before then, I was an outdoor girl, always climbing trees or hiking or basically living outside when not in school. Betty is two years older than me and had already a collection of several N. Drew (as we still affectionately call them) books. One boring day, she threw one at me while I was lounging on my parent’s bed. I clearly remember studying the hard cover of The Secret of Red Gate Farm, even reading the back cover with interest. Then I slowly opened the book in true dramatic fashion – well that’s how I remember it anyway. I couldn’t put it down until I was finished reading it! The rest is history. 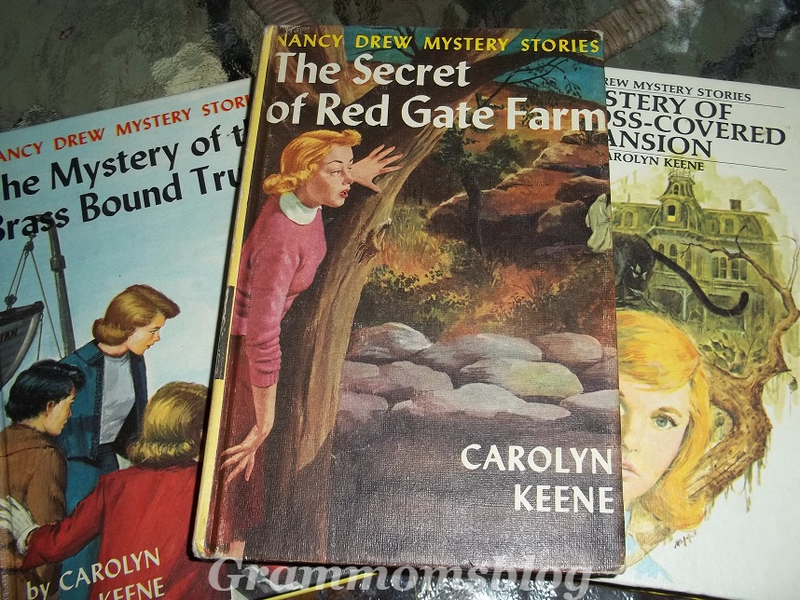 The Nancy Drew books were written by Carolyn Keene, who was actually a series of ghostwriters over the years. The first mystery story was The Secret of the Old Clock published in 1930. I have a first edition copy of that treasured favourite along with several other first editions. Today, there are new (and different) Nancy Drew mysteries for young audiences but I LOVE reading the old classic books – the first 45 mysteries. I love how I’m swept away to another time when life was simpler, except for Miss Nancy Drew. Both Betty and I bought hard cover Nancy Drew books while we were teenagers. I know I continued to purchase them even after I grew up, married, and left home. There was one book, out of print by then, that I was missing to complete our collection of original books but I found it at our local second hand book store. Actually the owner had taken my name and the specific book I was looking for and when it came in a year later, she called me. When Betty’s daughter Brodie was a teen, all the books I had were sent to her to read. Then when my daughter Kristi was a teen, all the books came back to me where they have remained lovingly tucked on the top 3 shelves of my bookshelf. This summer, I wandered downstairs on a mission to choose a N. Drew book to read. I thought I would be able to leisurely spread the reading over a week, but alas, I was swept up in the mystery story and finished reading it a few hours later. Now I have a few Nancy Drew books on the table beside me so I can read whenever the mood strikes me. I know why I like these books because the print is larger than most paperbacks and the paper is heavier. It’s easier on my eyes. AND because 50 years has passed since I read my first N. Drew story, I can’t remember how they turned out so it’s like reading them for the first time!